HIGHLAND HEIGHTS – The gap closed further than the regular season. It was just a case of the Highlands Bluebirds softball team not being able to get anything going offensively against Haylee Smith and the Notre Dame Panda defense. Smith and company allowed just two Highlands base runners in a 3-0 one-hit win. Neither base runner advanced past first base. The loss ended an incredible turnaround season for Highlands. The Bluebirds finished 18-12 after going 10-19 a year ago. On the other side, Notre Dame (27-7) faces Conner for the region championship. The Pandas had beaten the Bluebirds three times in the regular season by a combined score of 27-4. Smith transferred from Ryle to Notre Dame in the offseason. The sophomore has played a huge role in guiding the Pandas to a 21-0 mark against region competition. Smith only struck out one Bluebird in the win. But she constantly hit her spots making it difficult for the Bluebirds to make great contact and drive it places. Bailey Spencer became the first base runner for the Bluebirds in the second inning. She reached on an error with two outs. The other Bluebird base runner also reached with two outs as Brennah Dutcher singled up the middle to break up Smith’s no-hit bid in the seventh. Brooke Dill ran for Dutcher. Spencer pitched a good game for Highlands. Spencer struck out seven while allowing six hits and a walk. Coach Coffey said the jitters played a role in the Highlands defensive struggles. The Bluebirds committed five errors and they played roles in two of the Notre Dame runs. Abby Jones led Notre Dame at the plate going 2-for-4 with a double. Emma Jacobs ran for her both times she reached. The Pandas scored the lone run they needed in the first. Leadoff hitter Laura Finke singled then took second on an error. After moving to third on a sacrifice bunt, Smith singled her home. Notre Dame loaded the bases later in the evening but could not push any more runs across. The Pandas scored another run in the third. Jones doubled and Jacobs later scored on a Maria Schaefer single. Notre Dame scored its final run in the fourth. Finke reached on an error, stole second and scored after two more Highlands errors. The Bluebirds do not have any seniors on this year’s squad. They have three juniors in Ashley Grosser, Turner and KC Broering so they hope to carry the momentum from this year into next season. Many of the girls play travel ball and will soon continue to do offseason workouts. HIGHLAND HEIGHTS – The Highlands Bluebirds softball team knew it needed to play error-free ball to advance in the 9th Region tournament. Conversely, the Bluebirds also knew they needed to take advantage if the opponent did make errors. They found out the importance of both in a 3-1 quarterfinal win over the St. Henry Lady Crusaders at Northern Kentucky University on Wednesday. This marked the first region win for the Bluebirds since 2008. That team also beat St. Henry, 10-0 before losing 7-0 to Ryle in the region semifinals. Highlands plays in the region semifinals back at NKU at 6 p.m. against Notre Dame (26-7). Conner faces Dixie Heights at 4:30 p.m. in the other semifinal game with the championship on Friday at 5:30 p.m.
St. Henry (20-12) made three errors to none for Highlands (18-11). The three errors came in the bottom of the third. Payton Leighty and Whitney Quillen reached on errors. Two outs later, they scored when Brennah Dutcher hit a grounder to third. St. Henry third baseman Molly Dietz threw it wild allowing Leighty and Quillen to score to give the Bluebirds a 2-0 lead. That lead gave Highlands freshman pitcher Bailey Spencer and the defense enough to work with. Spencer struck out four and the Lady Crusaders left runners at first and third in the top of the sixth. The Lady Crusaders outhit the Bluebirds, 5-4. Gabby Stewart went 2-for-3 to lead St. Henry with Noelle Butts and Dietz recording doubles. Stewart singled home Dietz in the fourth for St. Henry’s only run. The only extra-base hit for Highlands came in the first inning when Haley Coffey tripled. Quillen, Shelby Graybill and Ashley Grosser added singles for Highlands. The Bluebirds had opportunities to add more runs. But they left Haley Coffey on third in the first and left the bases loaded in the fifth. Butts finished with three strikeouts for St. Henry. Highlands also beat St. Henry, 8-6 on April 8. But Highlands did add an insurance run in the sixth. Grosser singled and Spencer landed a sacrifice bunt. Grosser moved to third when no one from St. Henry covered the bag. Grosser then scored when Kendall Turner grounded out. The next challenge for Highlands is to beat a loaded Notre Dame Panda squad. The Pandas are 20-0 against region opponents, including 3-0 against the Bluebirds this year. They have outscored the Bluebirds, 27-4. The Newport Central Catholic Thoroughbreds softball team could not come up with key plays in Tuesday’s back-and-forth 9th Region quarterfinal contest at Northern Kentucky University. The Thoroughbreds (15-14) took a two-run lead in the top of the eighth. But they wound up surrendering three in the bottom of the inning in a 6-5 season-ending loss to the Dixie Heights Lady Colonels (14-14). Loren Zimmerman recorded a two-run triple in the eighth to give the Thoroughbreds the lead. They’d trailed 3-2 entering the top of the seventh. But Christina Enzweiler hit a game-tying single to left. Dixie Heights tied the game in the eighth when Megan Estenfelder singled with two outs and the bases loaded. Then Mary Beth Odom hit one hard to left for the game-winner. Dixie Heights scored twice in the first inning before NewCath came back and tied it. Enzweiler singled and advanced to second on an error before scoring on another Lady Colonel error. Molly Mertle then scored on an error to tie the game. Dixie Heights outhit NewCath, 11-10 but committed four errors to two for the Thoroughbreds. Michaela Ware led the Thoroughbreds going 3-for-5 with Taylor Burkart and Enzweiler both recording two hits each. Burkart had a sacrifice and Enzweiler a run batted in. Erin Snyder and Julie Morehead led Dixie Heights with three hits each. Morehead and Estenfelder recorded two runs batted in each. Sarah Neace pitched all eight innings in the loss for NewCath. She struck out four and allowed just three walks. Courtney Garrett pitched all eight innings for Dixie Heights. She struck out seven and walked two. The Thoroughbreds graduate just one player off this year’s 36th District championship team. That is Enzweiler. G. Michael Graham Photo. Highlands first baseman Todd Ramey (right) gets in position while St. Henry base runner Rex Rogers leads off. The Bluebirds lost 3-2. FLORENCE – The Highlands Bluebirds baseball had not won 20 or more games since chalking up 22 victories in 2007 entering the season. The Blue and White hoped to end that string in the 9th Region quarterfinals Monday and more importantly, advance in the tournament for the second straight year. It did not happen as St. Henry won 3-2 in extra innings at University of Cincinnati Medical Center Stadium. Highlands caught fire in the postseason last year. The Bluebirds downed Conner, 9-6 before beating Dixie Heights, 6-4 to advance to the 9th Region title game where they lost, 3-1 to rival Newport Central Catholic. Highlands also won the 36th District championship last year. The Bluebirds could not consistently hit St. Henry ace Mitch Kuebbing. Kuebbing struck out 11 Bluebirds. Highlands batted .200 (6-for-3) against him while the Crusaders batted .258 (8-for-31). Mitch Jones pitched the first six innings for Highlands. He struggled in the first but settled down not allowing a Crusader past second base the next five innings. Joey Cochran pitched the last two innings for the Bluebirds. Jones and Cochran combined to strike out seven Crusaders. Highlands (19-18) fell behind 2-0 in the first inning when the Crusaders (17-18) put together a two-out rally. Rex Rogers infield singled and moved to third on a Markgraf ground-rule double. After Anthony Lacorte walked to load the bases, Craig Rose singled on a 2-2 count to left scoring Rogers and pinch-runner Michael Niemer. Highlands had a chance to put some runs on the board in the bottom of the first frame. With two outs, Todd Ramey and Gabe Schultz recorded infield singles and Kuebbing hit Quentin Murray with a pitch to load the bases. But Kuebbing coaxed Evan Allen into grounding out at first. The Bluebirds also put runners on first and second base in the second inning as Kuebbing hit Jake Lester and Jac Collinsworth with pitches. But Highlands could not push them across. Highlands dented the scoreboard in the third inning. Ramey doubled and moved to third on a wild pitch. With the infield draw in, Schultz recorded another infield single to score Ramey and cut St. Henry’s lead to 2-1. The Bluebirds tied the game at 2-2 in the bottom of the sixth. Quentin Murray tripled to left and Brady Murray ran for him. Highlands then executed another squeeze. Brady Murray ran hard home and Evan Allen landed the bunt to score him. St. Henry retook the lead in the eighth inning at 3-2. Alex Conradi doubled and moved to second when Rogers singled. Rogers moved up to second on a throw prompting Highlands to intentionally walk Markgraf to load the bases. One out later, Craig Rose drew a bases-loaded walk allowing Conradi to score before Cochran retired the next two St. Henry batters. The Bluebirds did have a chance to win the game in the botton of the seventh. With one out, Molina reached on a third-strike wild pitch and Jake Whitford singled him to second. But Kuebbing got Ramey to fly out to right and struck out Schultz to end the threat. Conradi and Rogers both went 2-for-4 with a run scored for St. Henry. Rose had all three runs batted in for the visitors. Ramey and Schultz also went 2-for-4 to lead Highlands. Ramey scored a run and Schultz had a run batted in. The Bluebirds graduate nine seniors in Jake Heck, Jake Lester, Jake Liggett, Molina, Quentin Murray, Schultz, Colin Seidl, Jac Collinsworth and Reid Schroder. They helped revive the program. Last year’s run marked the first two region wins since 2002. But Highlands does return some solid players for next year. Whitford, Ramey and Evan Allen are the returning starters with Cochran, Jones and Martin coming back to pitch. G. Michael Graham Photo. Newport Central Catholic pitcher Josh Cain delivers to the plate in Monday's 9th Region quarterfinal contest at University of Cincinnati Medical Center Stadium. Cain threw six solid innings striking out four. But the two-time defending region champions fell to Dixie Heights, 2-1 in the bottom of the seventh. FLORENCE – It marked a tough way to end the season Monday. The Newport Central Catholic Thoroughbreds baseball team (20-14) dropped a 2-1 decision to the Dixie Heights Colonels (26-12) with one out in the bottom of the seventh of the 9th Region quarterfinals. That sank the hopes of a three-peat for NewCath, which also won the region in 2008. The game took place at University of Cincinnati Medical Center. Instead, the Colonels advanced to the region semifinals Wednesday. Dixie Heights lost to Highlands in the region semifinals last year. Matt Wehrle led off the inning for the Colonels with a single up the middle then took second on a wild pitch before Casey Cox moved him to third on a ground out forcing NewCath to bring the infielders and outfielders in. On a 2-0 count, Ethan Harrison singled to left to bring in Wehrle to win the game for the Colonels. Garrett Combs pitched a complete game for Dixie Heights. He stuck out seven Thoroughbreds while allowing three hits and four walks. Josh Cain pitched six innings for the Thoroughbreds before Bartels pitched the seventh. Cain struck out four and allowed two hits and two walks. Bartels also allowed two hits. The issue with the four hits is they came in the same innings. The first pair let the Colonels tie the game in the fourth. Henry Kerns doubled and Seth Caple singled him in to tie the game at 1-1. Cain and the Thoroughbred defense did retire the next three batters to minimize the damage in that frame. The Thoroughbreds did pitch out of a tough situation in the bottom of the sixth. Adam Daria walked before stealing second and advancing to third on a throwing error. But Cain struck out Kerns before intentionally walking Caple. Evan Hicks ran for Caple both times he reached base. Cain then struck out Eric Elkus before coaxing Nick King into grounding out to Colin DuPont at second. NewCath scored its lone run in the third. Zach Pangallo walked with one out and one out later, Cain doubled to the right center gap to score him. Pangallo finished 2-for-3 and walked the other time to lead the Thoroughbreds at the plate. Despite not hitting the ball well, the Thoroughbreds did have other chances to score. Zach Pangallo singled to lead off the first and moved to second after Combs hit Dom Pangallo with a pitch. But Combs retired the next three NewCath players to end the threat. The Thoroughbreds also left runners in scoring position in the third, fifth and seventh innings. Zach Pangallo singled to start the fifth, took second on a sacrifice but then stole third with two outs before Combs coaxed Pete Collopy into popping out. In the seventh, Nick Seibert walked before Michael Bueter sacrifice bunted him to second. After Zach Pangallo flied out, Combs hit Dom Pangallo with a pitch. But Cain flied out to end the threat. The Thoroughbreds graduate nine seniors from this year’s squad. They are Cain, Bueter, Collopy, Dom Pangallo, Kevin Hoffstedder, Seibert, Bartels and Alex Grau. Grau could not play after fouling off a pitch below his right eye in Thursday’s 36th District Championship 3-0 loss to Highlands. It still marked another great season for the Thoroughbreds. They won their first All “A” state championship a few weeks ago. G. Michael Graham Photo. Highlands senior Jake Lester (14) waits on a pitch while Newport Central Catholic catcher Kevin Hoffstedder waits. The Bluebirds beat the Thoroughbreds, 3-0 to win their second straight 36th District championship. HIGHLAND HEIGHTS – This one did not have the extra-inning drama that the regular-season did. It took just a few key hits and the same solid pitching and defense that helped the Highlands Bluebirds all season in a 3-0 District 36 Championship win over the Newport Central Catholic Thoroughbreds on Thursday at Morscher Field. This marked the second straight district crown for the Blue and White. The regular-season contest on April 25 at Highland Park went 13 innings before Highlands won 4-3. That gave the Bluebirds the top seed for the tournament. Highlands pitchers Joey Cochran (5-2) and Mitch Jones outdueled Connor Bartels (5-3) and Michael Bueter in the low-scoring contest. Cochran pitched into the seventh before Jones came on and struck out three Thoroughbreds. Cochran struck out two and the defense played error-free behind him. The Bluebirds managed just four hits off Bartels and Bueter. But they came from the same hitters as Jake Whitford and Todd Ramey both went 2-for-3 batting second and third respectively. Whitford scored twice and had a run batted in and Ramey batted in two. Whitford homered and doubled and Ramey recorded two singles. Ramey also stole two bases. Bartels and Bueter combined to strike out three Bluebirds (19-17). Bartels retired Highlands in order in the first three innings and the fifth. Whitford’s home run came in the bottom of the fourth after Bartels retired the first 10 Highlands batters. He belted a home run to right field for the only run the Bluebirds needed to win the game. Ramey then singled, took second on a wild pitch before stealing third and scoring on the only error of the game to put Highlands up 2-0. That NewCath error also allowed Quentin Murray to reach on a ground ball. The Bluebirds added an insurance run in the sixth. Whitford doubled and scored when Ramey singled to right. The Thoroughbreds (20-13) outhit the Bluebirds percentage-wise .240 (6-of-25) to .182 (4-of-22). But all the NewCath hits were singles and only two came in the same inning in the seventh. The Thoroughbreds did not see anyone record a multi-hit game nor have any runners advance past second base. NewCath put runners on first and second in the second inning with two outs. But the Murray threw a perfect strike to Ramey at first to pick off Nick Seibert. Murray made another defensive gem in the next inning. Bueter tried to bunt Colin DuPont over after DuPont singled. Murray caught the ball with his bare hand before it hit the ground and threw to Ramey to double off DuPont. The Thoroughbreds also put runners on first and second with two outs in the seventh after Seibert singled and Bartels moved to second. But Jones struck out DuPont to end the game. NewCath leadoff hitter Alex Grau left the game in the first inning. He fouled a 2-2 pitch off and the ball hit just below his right eye. The ambulance later came and took him to the hospital. The 9th Region Tournament will be at the home of the Florence Freedom starting Monday with the draw taking place Saturday. Highlands faces St. Henry, Ryle or Beechwood. The two-time defending region champion Thoroughbreds battle Dixie Heights, Boone County or Covington Catholic. The second-seeded Thoroughbreds (15-13) edged the Bluebirds (17-11) at Northern Kentucky University on Thursday to capture their second straight district crown. The teams received seeds this year. NewCath sophomore Sarah Neace and Highlands freshman Bailey Spencer locked up in a pitchers dual. Neace struck out four and allowed just two hits, two walks and hit one batter. Spencer struck out seven and allowed three walks and two earned runs. Both teams had scoring chances in the first. But neither team scored until the sixth inning. Kristin Schreiber doubled to center field and Taylor Burkart bunted her to third before she scored when Morgan Martini singled. Molly Mertel then doubled in Martini to put NewCath up 2-0. The Bluebirds came back and scored their lone run in the bottom of the inning. Haley Coffey tripled to center and scored on an NewCath error with two outs. The 9th Region Tournament takes place at Conner starting Monday. Walz-Richey wants to be known as "caring person"
The honors for her great playing career may continue to trickle in 17 years after the amazing career ended. That’s why Walz-Richey said coaching is tough sometimes. Her older brother Jeff Walz said virtually the same thing weeks ago. Walz is the head coach of the University of Louisville women’s basketball team. Her husband of nearly 10 years, Bert Richey, said her personal plaques and trophies like the 1996 Gatorade Player of the Year are stored away in their downstairs basement. But pictures with players current and past grace the refrigerator because the relationships are more important to her than her personal awards. Richey even said the entire family is that unselfish. Walz-Richey said and her three older brothers along with her parents had dinner and took vacations as a family. The family played a vital role in her basketball career. She still leads the state of Kentucky with 4,948 all-time career points. During her playing days, Walz-Richey helped Highlands to three 9th Region championships. The Bluebirds finished state runner-up to the now defunct M.C. Napier of Hazard her sophomore year in 1994. While she likes to win, Walz-Richey said not winning a state championship as a player does not drive her coaching-wise. Walz coached his sister for a year at Western Kentucky University. He said things worked out well and she learned some things from him that year. Richey has been an assistant at Highlands for a couple of years. He said he understands his role as an assistant and the couple does not bring the coaching job home while around their two daughters Jenna and Bailey. Six seniors graduated from this past year’s 26-8 squad that won the 36th District Championship and finished 9th Region runner-up to eventual state runner-up Notre Dame. Three are playing college sports next year. Leah Schaefer and Jesse “Dirt” Daley will play at Xavier University and Thomas More College respectively and Ava Abner will play soccer at Arkansas State University. Ava Abner said her bond with Walz-Richey developed over a period of time. One of her former players in Angela Healy played at nearby Northern Kentucky University. Healy now teaches sixth grade and was just named head coach at Greeley Central just north of Denver, Colorado and Walz-Richey was one of the first people to know that. The relationships with the current players developed because Walz-Richey has been head coach for 11 years. The Bluebirds are 201-125 during that time with three district championships. That’s been the case for returning players like rising sophomore Brianna Adler. 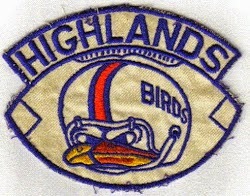 Adler’s older sisters Mallory and Alex also played for Highlands during Walz-Richey’s tenure. Adler and Haley Coffey will be the returning starters this season. Other returning players looking to take bigger roles include Tomi Blanton, Whitney Quillen, Lydia Graves, Alex Combs and McKenzie Leigh. Walz-Richey said the staff is already gearing toward the next steps with the program. During the summer, Highlands often partakes in team camps and summer basketball. That has included trips to Louisville in the past. The top-seeded Highlands Bluebirds baseball team put 12 on the scoreboard in the first inning to quickly put to rest any chances of an upset. They used that inning to run-rule the Newport Wildcats in five innings, 13-1 Wednesday at Morscher Field in the 36th District semifinals. Highlands (18-17) faces second-seeded Newport Central Catholic (20-12) today at 5 p.m. for the district championship back at Morscher Field. That inning proved to be more than enough for pitcher Joseph Martin. Martin threw a complete game striking out seven to go with three hits and no walks. The Bluebird defense committed no errors behind him. Highlands pounded out 14 hits. Hector Molina, Jake Whitford, Todd Ramey and Jake Lester all finished 2-for-2 for the Bluebirds. Whitford tripled on his way to three runs batted in and two runs scored with Ramey hitting a home run on his way to two RBI and two runs scored. Lester batted in three and Molina also scored twice. After the first inning, Highlands added another run in the third to go up 13-0. Newport scored its only run in the fifth. Highlands and NewCath took 13 innings on April 25 in Fort Thomas to decide the regular-season contest. The Bluebirds won 4-3. The Thoroughbreds won the regular-season contest last year before the Bluebirds won the 36th Championship contest. But NewCath won the 9th Region championship game before losing to Henderson County in extra innings in the state quarterfinals. HIGHLAND HEIGHTS – It is just a matter of putting solid offense and defense together consistently for the Highlands Bluebirds softball team. When the Bluebirds do that, chances of winning dramatically increase. In the case of Tuesday’s game, it let them put the game away early in a 15-0 three-inning run-ruling of the Dayton Lady Devils in the 36th District semifinals at Northern Kentucky University. Defensively, Bailey Spencer threw a no-hitter striking out two and the defense did not make any errors behind her. Dayton’s lone base runner came in the second inning when Alicia Hornsby walked. On the other side, top-seeded Highlands constantly hit the ball into open parts of the field going 14-of-22 for a .636 average against Dayton pitchers Aubry Donelan and Kilee Donelan. Every slot in the order scored once for Highlands except for the second one. The Bluebirds also took advantage of two Dayton errors. The Bluebirds scored eight in the first before adding four in the second and three in the third. Haley Coffey and Whitney Quillen played for the Highlands district championship basketball team that struggled in the title game against Newport in the first quarter before pulling away. Haley Coffey and Quillen helped make sure that did not happen in this game. Brennah Dutcher led Highlands at the plate going 3-for-3 two runs batted in and a run scored. Whitney Quillen, Shelby Graybill and Ashley Grosser all added two hits each. Quillen had a grand slam inside the park home run in the second. Turner added a triple and Spencer doubled. Quillen led everyone with five RBI and K.C. Broering scored a game-high three runs. Highlands had to make some adjustments at the plate. The speeds were slower than what they’d seen against teams like Ryle and Notre Dame. The Bluebirds (17-10) take on Newport Central Catholic (14-13) for the district championship on Thursday. Game time is 5 p.m. The top-seeded Bluebirds (17-17) will take on Newport at 5 p.m. at Morscher Field in the 36th District semifinals today. Newport beat Dayton, 9-0 Tuesday. The winner faces host Newport Central Catholic (20-12) at the same time on Thursday. The Newport Central Catholic Thoroughbreds baseball team shut out the Bellevue Tigers, 4-0 in the 36th District semifinals Monday. Josh Cain pitched the first six innings and threw a masterpiece striking out 11 and walking one for the Thoroughbreds (20-12). Teammate Colin DuPont pitched the seventh as the two allowed just six hits. The Thoroughbreds did not score until the fourth inning. They scored one in each of the fourth and fifth innings before adding two insurance runs in the sixth. NewCath managed nine hits against Bellevue pitcher Briley Seiter. Cain, Connor Bartels and Kevin Hoffstedder all managed two hits each for the Thoroughbreds. Cain, Bartels and Alex Grau had doubles for NewCath and DuPont tripled. The Thoroughbreds also displayed their aggressive base running. Cain swiped tw bases with Bartels and Hoffstedder nabbing one each. The Tigers did not record any extra-base hits. Zack Poinsette and Tate Grainger both went 2-for-3 to lead them offensively. The second-seeded Thoroughbreds receive two days off before playing host to the district championship at Morscher Field on Thursday. Game time is 5 p.m. The second-seeded Thoroughbreds (14-13) built a comfortable 4-0 lead after three innings and held on to defeat the Lady Wildcats (11-8) on Monday at Northern Kentucky University. Sophomore pitcher Sarah Neace threw a two-hitter for the Thoroughbreds on the mound. She struck out 12, walked four and allowed just one earned run. The Thoroughbreds banged out nine hits. Kristin Schreiber led the way going 3-for-3 with a double and three runs batted in and Loren Zimmerman went 2-for-3 with three runs scored and a double. Morgan Martini added a triple. NewCath will face either Highlands or Dayton in the district championship on Thursday at NKU. Game time is 5 p.m. The Highlands Bluebirds baseball team (17-17) finished the regular season with a huge road victory Saturday. Highlands downed the Ryle Raiders, 7-3 in Union. Mitch Jones, Joey Cochran and Jake Liggett combined to throw a four-hitter and strike out four Raiders. Ryle (28-6) came into the game ranked seventh in the state in some polls. But the Bluebirds put together 11 hits and took advantage of five Raider errors in the win. Todd Ramey led the Bluebirds offensively going 3-for-4 with two doubles, two runs batted in and two runs scored. Quentin Murray and Evan Allen added two hits each. Highlands scored two runs in the first and third innings and added three in the fifth to go up 7-0. Ryle scored three in the bottom of the sixth. Highlands plays in the 36th District Tournament next week. Several games were called off Friday as a result of rain. The cancelled games were Highlands baseball against Conner and the Highlands softball game at Walton-Verona. Both teams play Tuesday in the 36th District Tournament as top seeds. The baseball team faces either Dayton or Newport and the softball team battles either Dayton or Bellevue at 4:30 p.m. at Northern Kentucky University. The Newport Central Catholic baseball team saw its game against Boone County called off. The Thoroughbreds face Bellevue to open the district tournament Monday at Morscher Field. The Thoroughbreds (13-13) saw their game against Cooper Thursday before losing 4-0 at Boone County on Friday. They also managed to get in a game on May 9 and beat Cincinnati McAuley, 7-6. Lady Rebel seventh grader Olivia Jackson threw a one-hitter. The lone hit for the Thoroughbreds on Friday came in the first inning when Casey Kohls hit a sharp single to right center. NewCath faces Newport in the 36th District semifinals on Monday at 6 p.m. at Northern Kentucky University. G. Michael Graham Photo. Members of the Highlands softball team watch during Tuesday's game against Newport. Entering today's season finale, Highlands owns a 16-10 record. The Highlands Bluebirds softball team has made some great progress this season. The Bluebirds own a 16-10 record entering Friday’s season finale at Walton-Verona. Game time is 5:30 p.m.
Highlands has not won that man games since winning 18 in 2008. The Bluebirds will also be favored to win their second 36th District championship in three years. The Bluebirds took a huge step Tuesday in putting away a nice opponent in Newport (11-7). The Bluebirds run-ruled the Lady Wildcats in six innings, 15-5 and Lloyd Memorial in four innings, 16-0 on Thursday. Highlands has run-ruled several opponents this year. Three of the run-rulings came against district opponents. The Bluebirds finished 5-0 against district opponents with two 4-3 wins over Newport Central Catholic. This team has turned things in the right direction without any seniors. The Bluebirds have three juniors in Ashley Grosser, K.C. Broering and Kendall Turner and three sophomores in Emily Johncox, Payton Leighty and Whitney Quillen. But Grosser said the team chemistry has been great. The Bluebirds have had a number of contributions from freshmen as well. Freshman Shelby Graybill ranks among the state’s hitting leaders. The Bluebirds have lit up the scoreboard this year averaging about seven runs a contest. They’ve scored 10 or more runs in seven games this year. Coffey lists the Bluebirds as a darkhorse in terms of the 9th Region behind Ryle, Conner and Notre Dame. Highlands is 0-7 against those teams this year. In the loss to Notre Dame on Monday, the game was close until the sixth inning when the Pandas pulled away for an 8-1 win. Highlands plays at 4:30 p.m. in the district semifinals on Tuesday at Northern Kentucky University. The Bluebirds take on the winner of either Dayton or Bellevue.